The Monkey King is well known for his prowess with the staff, but the first seven chapters detailing his early life, attainment of immortality, and rebellion against heaven surprisingly do not mention him training in martial arts. It’s generally understand, however, that he learns the art of combat while studying under the immortal sage Subhuti. Beyond the staff, Sun Wukong comes to master boxing, a skill he displays only a few times in the novel. A poem appearing in chapter 51 describes his unarmed battle with a rhinoceros demon. Martial historian Meir Shahar (2008) notes it “[gave] the author an opportunity to display his familiarity with the contemporary jargon of ‘postures’ (shi and jiazi), ‘Long-Range Fist’ (changquan), and ‘Close-Range Fist’ (duanquan)” (pp. 131-132). The double-kicking feet fly up. They stab at galls and hearts. “A Dragon Playing with Water” is quite vicious. The wrist twists around to seize Heaven’s bag. The rain driving down the flowers. The “Long-Range Fist,” stretching, is more slack, of course. How could it compare with the “Close-Range Fist’s” sharp jabs? Interestingly, many of these techniques are still known to this day, some better known by slightly different names. I consulted with martial artist Joshua Viney to learn what each technique involves. Joshua has lived and studied folk martial arts from village masters around the noted Shaolin Monastery (少林寺) for ten years. He currently maintains the Shaolin Yuzhai Youtube channel where he posts instructional videos. Please check it out. 1) Opening wide the “Four Levels Posture” (拽開大四平, Zhuai kaida siping) – An open fighting posture where the boxer stands in the horse stance (馬步, mabu) with arms outstretched to his sides. Also known as “Single Whip Horse Stance” (馬步單鞭開四平, Mabu danbian kai siping) (fig. 1), which is often associated with Taiji boxing (太極拳). 2) The double-kicking feet fly up (踢起雙飛腳, Ti qi shuangfei jiao) – Also known as “Double kicking feet” (二起腳, er qi jiao), this technique involves lifting up one knee to build upward momentum and then kicking high with the other (fig. 2). It is reminiscent of the “crane kick” from the Karate Kid (1984). 3) They pound the ribs and chests (韜脅劈胸墩, Tao xie pi xiong dun) – Possibly referring to the “Pushing palm” (推掌) or “Splitting palm” (劈掌), which is delivered into the solar plexus and up into the rib cage (fig. 3). From Joshua’s APPLICATION of Xiao Hong Quan video. 4) “The Immortal pointing the Way” (仙人指路, Xianren zhilu) – A double finger attack aimed at the eyes (fig. 4). The stance is often seen used in tandem with a sword. 5) “Lao Zi Riding the Crane” (老子騎鶴, Laozi qihe) – Most likely another name for the Crane stance (fig. 5). 6) “A Hungry Tiger Pouncing on the Prey” (餓虎撲食, E hu pu shi) – This name has been applied to many techniques. One variation known as “Fetching the moon from the seabed” (海底撈月, Haidi lao yue) involves a powerful hip and/or palm strike to the groin/lower midline of the body (fig. 6). The force of the hip strike is powerful enough to send someone flying backwards. Left: Setting up the attack. Right: The hit (from Joshua’s 13 Hammers of Shaolin video). 7) A Dragon Playing with Water (蛟龍戲水, Jiaolong xi shui) – Also known as “Dragon puking water” (蛟龍戲水能兇惡, Jiaolong xi shuineng xiong’e), this technique involves fluid, sweeping arm movements (most likely blocks or fake strikes) followed by simultaneous double fist blows (fig. 7). The technique is associated with Shaolin and Chang Family Fist (萇家拳), a martial art that influenced the development of Taiji boxing. 8) “Serpent Turning Around” (蟒翻身, Mang fanshen) – Also known as “Python turns over” (怪蟒翻身, Gaui mang fanshen), this technique involves a simultaneous chop to the throat and a pulling leg sweep, effectively knocking the opponent backwards (fig. 8). 9) “Deer Letting Loose its Horns” (鹿解角, Lu jie jiao) – A series of elbow strikes to the torso (fig. 9). One variant called “Plum blossom deer lies on a pillow” (梅花鹿臥枕, Meihua lu wo zhen) places the fist of the attacking arm against the temple, looking as if the practitioner is propping his head up in a resting posture. 10) The dragon plunges to Earth with heels upturned (翹跟淬地龍, Qiao gen cui dilong) – A shooting maneuver using the Falling stance (仆步, pubu) to dip below the opponent’s defenses and attack the lower extremities (fig. 10). Also known as 雀地龍走下盤找, Qiao dilong zou xiapan zhao). 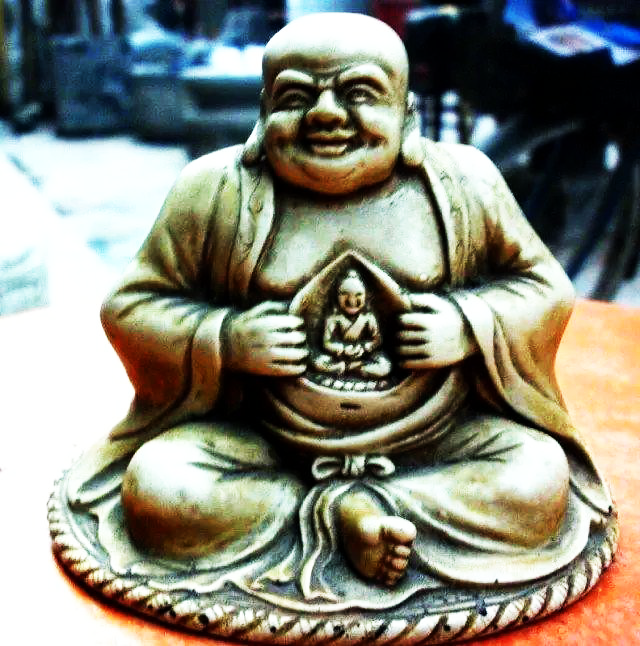 11) The wrist twists around to seize Heaven’s bag (扭腕拿天橐, Niu wan na tiantuo) – UNKNOWN. Mostly likely a headlock. 12) A green lion’s open-mouthed lunge (青獅張口來, Qingshi zhangkou lai) – More commonly known as “Lion opens mouth” (獅子大張嘴, shizi dazhang zui), this technique has two variations. The large frame version involves shooting in low, pulling up the opponent’s knee with one hand, while simultaneously pushing on their head with the other hand, knocking them over (fig. 11). This can be used for throwing an opponent as well. The small frame version involves cupping the hands to intercept strikes. 13) A carp’s snapped-back flip (鯉魚跌脊躍, Liyu die ji yue) – This can refer to both throwing an opponent and a move commonly referred to as a “kip-up”. The latter involves the practitioner flipping up from a supine position to a standing fighting stance (fig. 12). 14) Sprinkling flowers over the head (蓋頂撒花, Gai ding sa hua) – Also known as “Double cloud over peak” (雙雲頂, Shuang yun ding), this technique involves flourishing the hands above the head as a means of blocking, twisting an opponent’s arm, or disengaging from combat (fig. 13). 15) Tying a rope around the waist (遶腰貫索, Rao yao guan suo) – UNKNOWN. 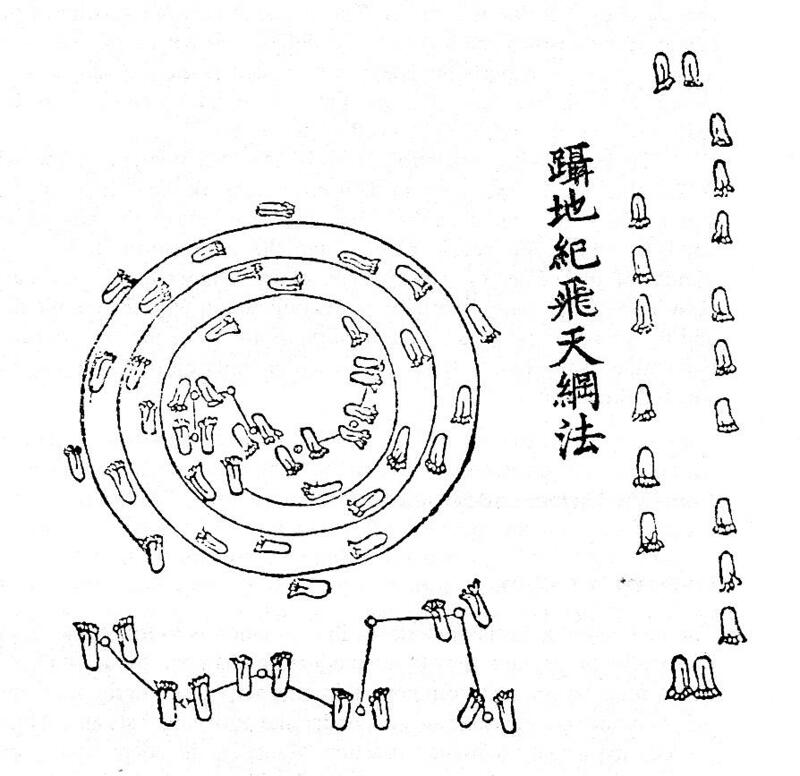 Possibly a circling step similar to one later used in Bagua Palm Boxing (八卦掌) (fig. 14). 16) A fan moving with the wind (迎風貼扇兒, Yingfeng tie shan er) – Crossed hands shooting out to intercept an opponent’s punch (fig. 15). 17) The rain driving down the flowers (急雨催花落, Ji yu cui hua luo) – Most likely a rapid succession of punches. 18) “Guanyin Palm” (觀音掌, Guanyin zhang) – A style of palm strikes. It is listed as number 70 of the “72 Training Methods of Shaolin” (少林七十二藝練法, Shaolin qishi’er yi lian fa) (Jin & Timofeevich, 2004, p. 229). 19) “Arhat Feet” (羅漢腳, Luohan jiao) – A style of kicking. 20) Long-Range Fist (長拳, Chang quan) – A family of Northern style martial arts known for their long-range punches and kicks and acrobatic movements. 21) Close-Range Fist (短拳, Duan quan) – A family of Northern style martial arts known for their compact, short-range, yet quick attacks. What follows is Joshua’s reconstruction of the fight. He makes an interesting observation that the fight may in fact be a theatrical stage combat version of known techniques. I think what we are seeing here is a Chinese Opera like performance of a fight that the author saw and perhaps asked about the names or recognised. I expect it would be very contrived. After this we are not told explicitly who does what and it may not be a one for one exchange. Nevertheless looking at the wording we can make a guess. It begins with a large fighting stance, probably the ‘single whip’ posture of holding the arms straight to the sides. Then both performers do a jumping kick towards each other to enter striking range. Given it uses the phrase 劈胸 ‘pi xiong’ (split chest) I expect they begin by using the chest splitting palm at one another and so cross hands in the center of the arena [fig. 16]. Once they have crossed hands I think the demon grasps Monkey’s hand and attacks with the fingers of the other hand at his eyes, doing the ‘immortal points the way’ technique. Monkey defends against this by shielding his face with his forearms, then spreading his hands and kicking at the monster’s stomach. This pushes the monster away and Monkey is left with one knee suspended and arms spread to the sides in the ‘Lao Tzu rides a crane’ posture. The Demon takes advantage of this unstable posture by rushing at him with the ‘hungry tiger pounces on prey’ technique, striking Monkey with his hips and grasping hold of him. Monkey uses the ‘dragon puking water’ technique, which erupts from below the demons arms and casts them aside, then rushes forwards again to attack with both hands. The Demon defends this by sticking close to the monkey and uses the ‘python turning its body’ technique to trip him up. But Monkey is strong and keeps his footing, counter attacking with a headbutt and multiple elbow strikes which form the ‘Deer-Horn’ technique. The Demon jumps away but Monkey pursues with the ‘ground dragon’ technique and attacks the demons groin, causing him to buckle over, whereby Monkey grasps his head with the ‘twisting heavens sack’ technique. The Demon defends by using the ‘Lion opens mouth lunge’ to stop Monkey and throw him down. The monkey recovers by flipping his body in the ‘carp jump’ technique. Then he withdraws from the center by a few steps ‘covering his head with the flowers’ overhead technique. The Demon similarly disengages from the center and puts up a guard, prowling slowly around Monkey with the ‘turning waist’ technique. I think the rest is describing more how they are evenly matched and face each other down rather than any other moves. ‘Iron fan stands against the wind’ is a common technique, a guard, and ‘rain falling on flowers’ is perhaps an eye strike but could also mean the intensity of the fight is like an urgent rain of punches. ‘Guanyin palm’ and ‘Luohans feet’ are both style names. Long fist vs short fist, how can they overcome one another? 10 rounds without a victor. Long fist and Short fist are the classic methods of Shaolin shenfa [身法, “Body postures”]. In order to strike the opponent one needs momentum, both physical AND psychological. Momentum is achieved by moving the dantian  as the centre of mass. In Short fist the dantian is rotated to add to power. In Long fist the whole dantian is thrown in the direction of the strike instead of rotated–much more powerful but also more wild and uncontrollable. In Shaolin philosophy, mind and matter are not severed, so physical momentum and psychological momentum are intertwined; when one has physical forward momentum, one simultaneously feels more confident. A poem similar to that from Journey to the West appears in the 120 chapter version of the Water Margin (水滸傳, c. 1594) by Yu Xiangdou (余象斗, c. 1560–c. 1640). The poem describes unarmed combat between a young man and woman. There are only two years between the publishing of Journey to the West (1592) and this book. However, I am unsure if either source borrowed from the other, especially since JTTW wasn’t in its final form upon its initial publishing. 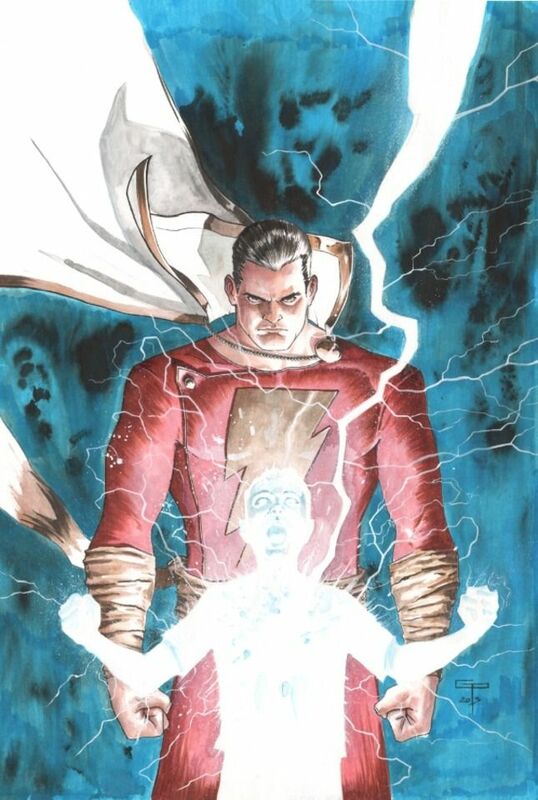 But it’s very well possible that both authors drew upon common source material. Joshua discovered two techniques from the Water Margin poem, namely “Phoenix Elbow” (拗鸞肘, Aoluan zhao), and “The Guard Head Cannon Stance” (當頭砲勢, Dang toupao shi), appearing together in the same print of an edition of the Collection of Military Works (武備志, Wubei zhi, c. 1621), a Ming treatise on military armaments and fighting techniques (fig. 17). This suggests Yu Xiangdou drew these moves from similar boxing or military manuals. Likewise, given “his familiarity with the contemporary jargon”, as noted in the introduction by Shahar, the author of JTTW may have also borrowed from such literature. Fig. 17 – The plate mentioning “Phoenix Elbow” and the “Guard the Head Cannon Stance”. The available evidence suggests Short fist is Monkey’s fighting style. As mentioned above, the poem in chapter three reads: “The ‘Long-Range Fist,’ stretching, is more slack, of course. How could it compare with the ‘Close-Range Fist’s’ sharp jabs?” (Wu & Yu, 2012, vol. 3, p. 13). Furthermore, after facing the rhino monster, Sun Wukong asks heavenly warriors to critique his boxing skills: “‘[H]ow did the fiend’s ability compare with Old Monkey?’ ‘His punches were slack’, said Devaraja Li, ‘and his kicks were slow; he certainly could not match the Great Sage for his speed and tightness'” (Wu & Yu, 2012, vol. 3, p. 14). Earlier in chapter one, Monkey faces a demon who had taken over his Water Curtain cave in the immortal’s absence. The two resort to boxing since Monkey is unarmed. The Monstrous King shifted his position and struck out. Wukong closed in on him, hurtling himself into the engagement. The two of them pummeled and kicked, struggling and colliding with each other. Now it’s easy to miss on a long reach, but a short punch is firm and reliable. 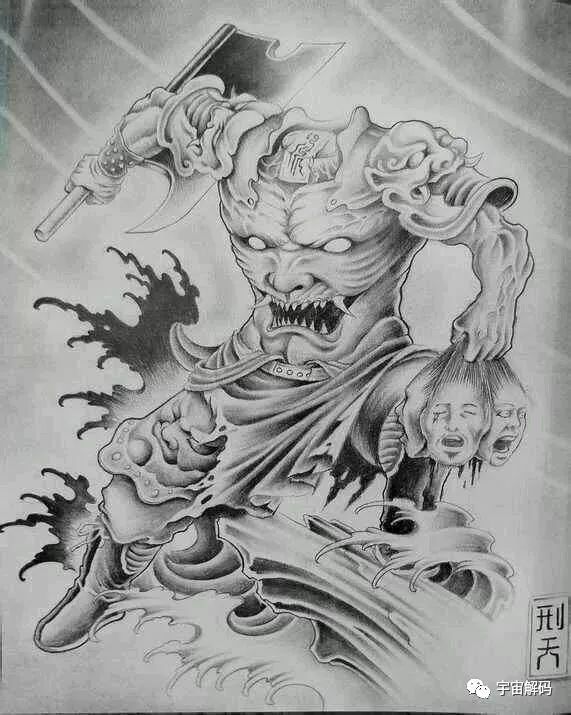 Wukong jabbed the Monstrous King in the short ribs, hit him on his chest, and gave him such heavy punishment with a few sharp blows that the monster stepped aside, picked up his huge scimitar, aimed it straight at Wukong’s head, and slashed at him (Wu & Yu, 2012, Vol. 1, p. 128). Wing Chun (Mandarin: Yong Chun, 詠春) is an example of Short fist. Although the style postdates the novel by at least two centuries, it showcases the quick, compact punches associated with Short fist. Take this video of Jackie Chan, for example. Now imagine Monkey using similar techniques in a fight with a much larger opponent, blocking or ducking to avoid attacks and replying with sharp punches targeted at vulnerable areas. I have found a few more instances of martial arts terms, this time related to weapons. Joshua was again kind to lend his knowledge to the subject. Striking at the head and arm. That one tilts the lance for swift, triple jabs. The “yellow dragon lying on the road” turns his back. Two monster-god’s strength is yet to be tried. One’s the Great Black King who’s now a spirit. Why wage this battle in the mountain still? 22) “White tiger climbing the mountain” extends his paws (白虎爬山來探爪, baihu pashan) – Mountain climbing stance is synonymous with Gong bu (弓步), or the bow stance. The white tiger denotes an overt attack of sorts. I imagine it would look similar to this spear technique. 23) “Yellow dragon lying on the road” turns his back (黃龍臥道轉身忙, Huanglong wo dao zhuanshen mang) – Possibly a retreating maneuver. Dear Monkey King! He raised the rod above his head, with both hands, using the style “Tall-Testing the Horse.” The fiend did not perceive that it was a trick. When he saw there was a chance, he wielded the scimitar and slashed at the lower third of Pilgrim’s [Monkey’s] body. Pilgrim quickly employed the “Great Middle Level” to fend off the scimitar, after which he followed up with the style of “Stealing Peaches Beneath the Leaves” and brought the rod down hard on the monster’s head. This one blow made the monster vanish completely (Wu & Yu, 2012, vol. 2, p. 83). 24) “Tall-Testing the Horse” (高探馬, Gao tanma) – Tanma (探馬) refers to a military scout, so a better translation would be the “High Scout”. This is a double-handed thrust aimed at the opponent’s face as a high fake. A corresponding fist technique, essentially a jab, is associated with Taiji boxing. 25) “Great Middle Level” (大中平, Da zhong ping) – Holding the staff level at the navel while in the horse stance. This allows for quick defence below the waist. 26) “Stealing Peaches Beneath the Leaves” (葉底偷桃勢, Ye di tou tao shi) – UNKNOWN. The name of this technique is normally associated with an attack to the groin, not the top of the head as implied in the quoted battle. Based on the sequence of events described above, it seems like Monkey fakes high, blocks the strike to his body, and then attacks the top of the stooping opponent’s head (since the latter ducked the high fake and attacked low). The two weapons are stuck together: the monkey is forcing down, the demon up. The monkey releases the pressure, circling his staff below the opponents weapon, so with the release of pressure, the opponent’s weapon flings upwards but with no control. 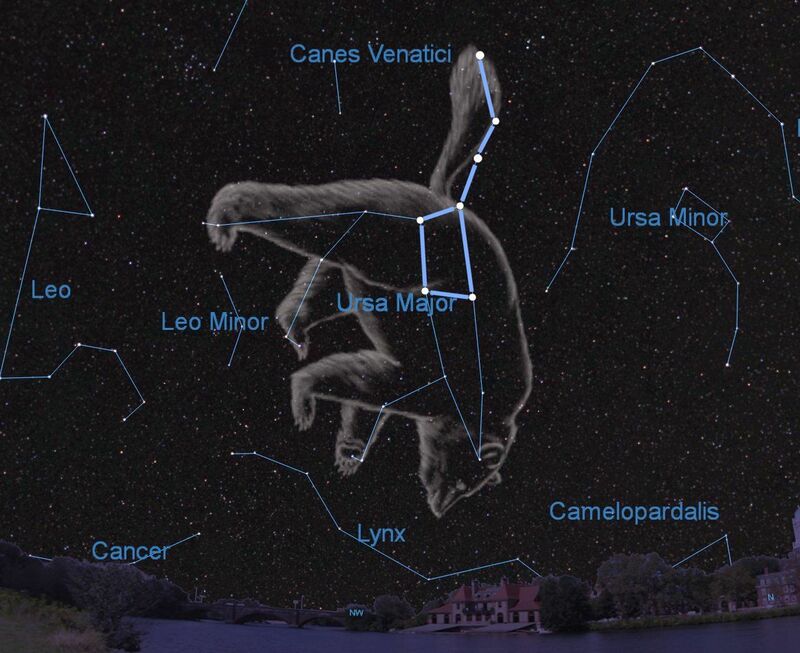 The monkey circles from this lower position, then turns over in a big circle and strikes the opponent downwards on the head. The Great Sage walked forward and picked up the rod with no effort at all. Assuming the style of the Python Rearing its Body, he pointed at the bandits and said, ‘Your lucks running out, for you have met Old Monkey! (Wu & Yu, 2012, vol. 3, p. 81). 27) Python Rearing its Body (蟒翻身, Mang fanshen). UNKNOWN. This is a differently translated version of a similarly titled technique mentioned above. See number eight (“Serpent Turning Around”). The previous listing referred to a boxing technique, while this again is for a weapon. In closing, I would like to quote a particular passage. While it doesn’t list a given technique, it highlights Monkey’s mastery of the staff. The portion that Anthony Yu translates as “manuals of martial arts” actually lists the names of two noted military manuals, both of which are listed among the Seven Military Classics of China. 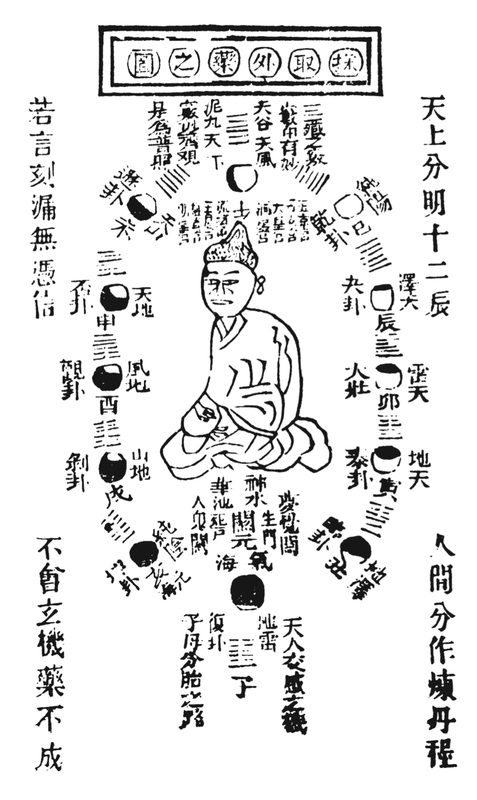 The first, the Six Secret Teachings (六韜, Liu tao), was published during the Warring States period (c. 475 – 221 BCE) but possibly contains information from as far back as the Qi state (1046 – 221 BCE). The second, the Three Strategies (三略, San lue), was most likely published during the Western Han period (206 BCE – 9 CE) (Sawyer, 1993). 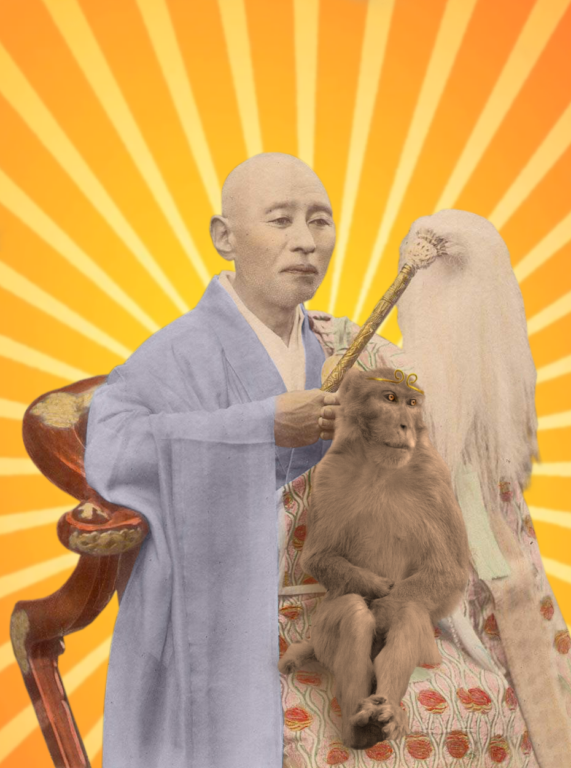 Associating Monkey’s martial arts skill with ancient and historically important manuals serves to further elevate his status as a great warrior and cultural hero. I did cultivation on Mount Flower-Fruit. and perfected with him the martial arts. I can tote mountains to chase down the sun. Moving stars and planets, I scare ghosts and gods. Of boundless change, Handsome Stone Monkey’s my name (Wu & Yu, 2012, vol 3, p. 243). Readers may think the Ancestor of Heart and Mind (方寸祖, Fangcun zu) is referring to Sun’s teacher, Master Subhuti. However, the supreme immortal threatened Monkey with eternal torment if he ever revealed the sage had been his teacher. A more literal translation of the aforementioned figure is “Ancestor Square Inch”. Square Inch (方寸fangcun) is a common metaphor for the “heart / mind” (心, xin, ), a broad concept written with a small character. This is just an interesting way of saying Monkey learned martial arts on his own via self-cultivation, thereby not revealing his true master. At the same time, it is a veiled admission of studying martial arts under the sage. 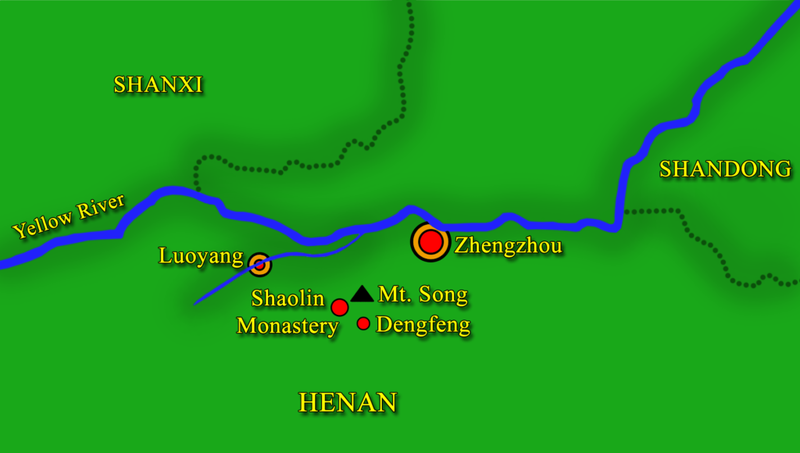 The above passage uses the term Wuyi (武藝), which was used to refer to Chinese martial arts as far back as the third-century CE. The term predates the more familiar Wushu (武術) by some three centuries (Lorge, 2012, p. 10). 1) For more information on Chang Family Fist and its progenitor Chang Naizhou, see Wells (2005). 2) The dantian (丹田, “cinnabar field”) is an area near the navel believed to be the body’s storehouse of spiritual energy. Sawyer, R. D. (1993). 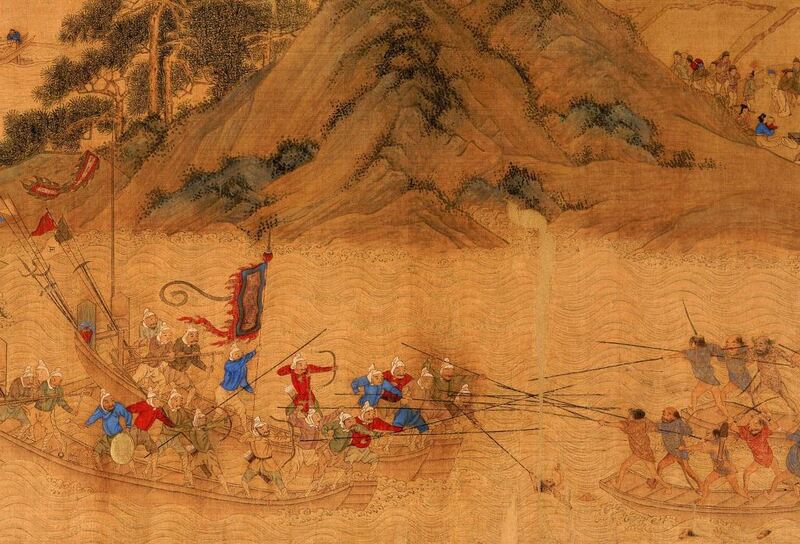 The seven military classics of ancient China. New York: Basic Books. Shahar, M. (2008). 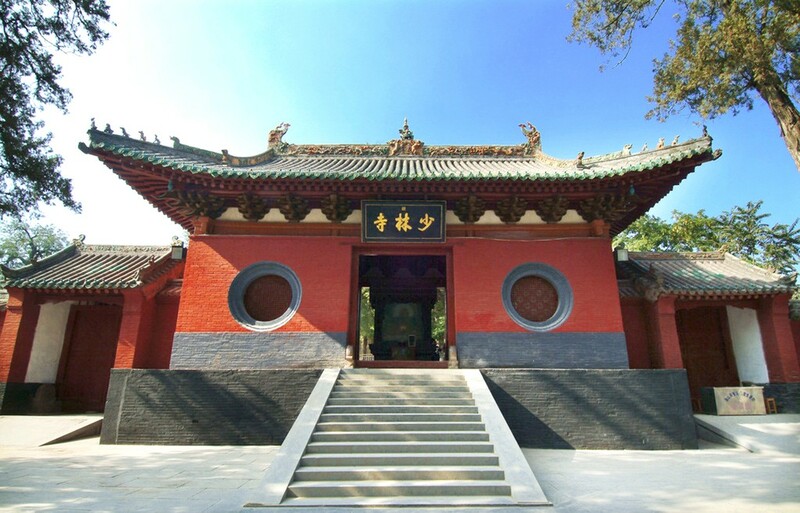 The Shaolin Monastery: History, Religion, and the Chinese Martial Arts. University of Hawaii Press. Wells, M., & Chang, N. (2005). Scholar boxer: Chang Naizhou’s theory of internal martial arts and the evolution of Taijiquan. Berkeley, Calif: North Atlantic Books. Wu, C., & Yu, A. C. (2012). The journey to the West: Vol. 1-4. Chicago, Ill: University of Chicago Press.